Join over forty international and domestic organizations at this year's Long Term Service Fair to learn about ways to serve after graduation. Students of all years and majors are encouraged to attend if they are interested in pursuing service options after college or during the summer. Representatives will be present from both domestic and international organizations, as well as both faith-based and secular programs. Organizations offer opportunities ranging from week-long, to month-long, to one or two years. Benefits of these programs include room and board, loan deferment, education awards, and travel and professional experience. Please come by the Pryz Great Rooms from 4-7 PM on Tuesday, Nov. 6, 2018. 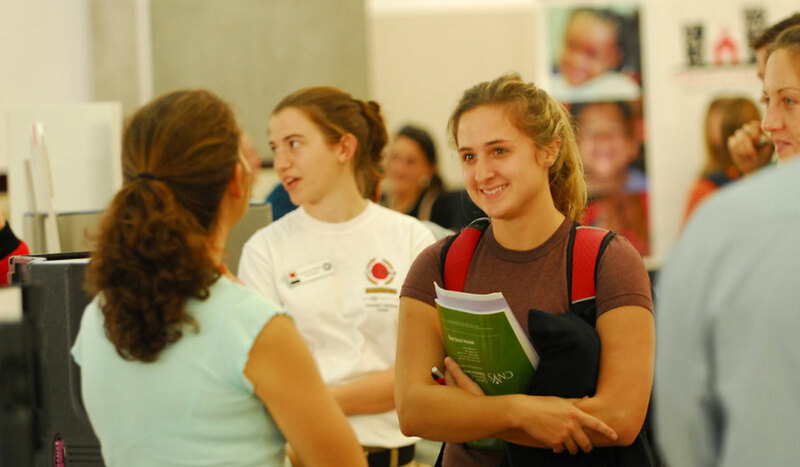 Thank you for your interest in joining The Catholic University of America during its 2018 Long Term Service Fair! Below, you will find information on how to register your organization, as well as details on getting to campus and participating in the event. To help promote your organizations, we will be hosting a raffle during the fair. We are looking for donations of t-shirts, bags, cups (anything) with your organization/logo on it! Please bring some giveaways with you to the fair. If you have any questions, please email cua-service@cua.edu, or call the Office of Campus Ministry at (202) 319-5575. Deciding what path to take after graduation can be daunting. Below are some resources to help you decide if long term service is the right path for you.